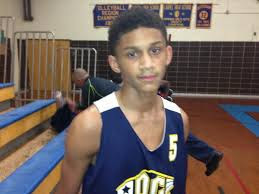 Prentiss Hubb is a national name to know on DC Assault 7th Grade team. Hubb starred this year at the AC Showcase and helped DC Assault finish #5 in the country. His play earned his a spot in the 4th Annual J.E.M. All Star Classic 7th Grade Game. The J.E.M. All Star Classic will take place August 17th at Trenton Catholic High School. Stay tuned as we bring you more top players that will be invited to this exclusive event.